Standing alone but not isolated, within easy reach of Auch the administrative and cultural capital of the Gers, this house stands proudly in mature gardens and is a building of some considerable stature. Beyond the gardens is the ever-changing vista of fields, trees and hedges. As we enter the gardens to the rear, we find a pond inhabited by a friendly marine tortoise. On the distant hillside we are offered a picture post-card view of two beautiful donkeys grazing on the neighbour’s field. Sensing that they have company the donkeys amble over curiously and accept a summer gift of figs freshly picked from the garden. As we further explore the gardens, we cross paths with both a brood of hens, and a cockerel who, like Chanticleer believed himself to be master of all he perceived. The pool (11m x 4m) area has been created to a back-drop of original old outbuildings; their attractive stone walls a perfect contrast to this modern addition to rural life. Our tour around the land has helped us to see that this property offers different styles of garden; from the woodland pathway to the front, the pond, the formal pool-side area, and the carefully tended lawns, and terrace area to the rear. In the manner of so many rural farmhouses the informal kitchen entrance is preferred to the grand main entrance door, and used for friends and family, as well as our afternoon visit. For a more formal reception, the old oak door to the main hall opens onto a vast hallway which bisects the house. In days gone this space would have been filled by a long oak table where workers would have feasted to celebrate harvest time, enjoying one of those copious meals for which Gascony is so renowned. By the kitchen door a shaded terrace area is covered by a rambling Virginia creeper to form a leafy, simple and yet effective, shelter from the sun. The kitchen is rustic and welcoming, with simple wooden units throughout and an old wooden table by the window where we sit and drink tea enjoying our sense of being disconnected from the outside world. A cat jumps through the kitchen window to add to the tally of animals. Owning large numbers of cats, dogs, hens, tortoises, along with the odd peacock for good measure, are perhaps perquisites to owning this property. 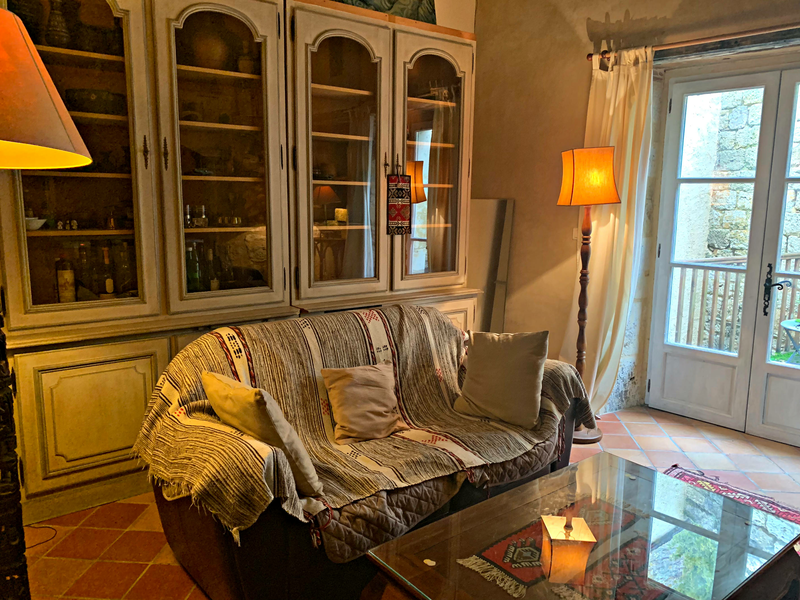 The property has the relaxed, well-loved patina which comes from a full and hearty rural life and would be well adapted to a family with children. There is nothing “showy” here. Nor is there anything to discourage children running through the house, and hallway to the gardens. The spacious rooms and vast surface area of this property invite noise, movement and family life. This is a house which has been loved and lived in, with generations gathering by the fire or feasting in the grand hallway. Nothing is too precious for use. This is not a museum. It is a home. The kitchen opens onto a large sitting room with an impressive sized fireplace where a collection of comfortable chairs and sofas are an invitation to relax on a cold winter’s evening. On the ground-floor there is a large double bedroom and a second north facing room containing the vestiges of a far more ancient kitchen. There is also a bathroom and WC on this level. On the south side, there are two further bedrooms. An immense loft space runs across the entire property, with full head height, where it is possible to see an intricate display of old oak beams; the framework of this impressive old building. It is only once we have relaxed into the comfortable lull of a house untouched by time, that the property offers its most unexpected of surprises. 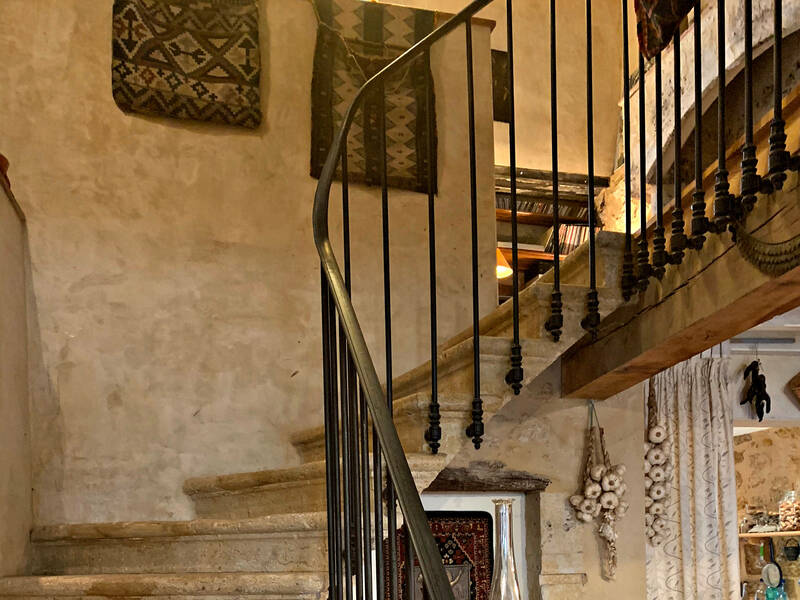 Attached to the property and yet a world apart, we discover an immaculate and beautiful two-bedroomed gîte with fine floor tiles and polished concrete stairs. This contemporary gem has been beautifully restored with all modern comforts, fittings and fixtures, and yet is in perfect harmony with the rest of the building. The gîte has a bathroom and separate WC on the ground floor, and one for the two bedrooms is on the first floor. The present owners let this space for much of the summer, but it could also provide accommodation for visiting friends or a permanent additional space for a large family. Two families could fit into this large and flexible property and benefit from separate gardens, and private entrances. The gîte benefits from an outside terrace where it is easy to imagine relaxing with a frosted glass of wine, while the children play in the pool, the tortoise bobs in the pond, the chickens strut across the lawns, and the donkeys do whatever donkeys do best on a lazy summer’s afternoon. Here at Bliss we were amazed by the sheer scope this property has to offer. It will certainly appeal to lovers of space and period features (old terracotta floor tiles, exposed stone walls). We were pleasantly jolted out of our comfort zone by the two contrasting sides to the same property; one barely touched by time, the other contemporary and stylish. The restored part of the building demonstrates what it is possible to achieve throughout. It also offers a perfect space in which to live while the rest of the property, should one so desire, be brought up to the same standard throughout.